Update 2018: Corail is not currently operational. Corail Helicopters was first established in the French island of La Réunion in the Indian Ocean. An island known for its dramatic landscapes of steep volcanoes, deep valleys and running waterfalls, it didn't take long for Corail to become the area's leading helicopter tour company. Since, Corail has expanded to St. Martin and are now known as the leading helicopter company in the Caribbean. They are the only company in the Caribbean that is EASA (European Aviation Safety Agency) approved. 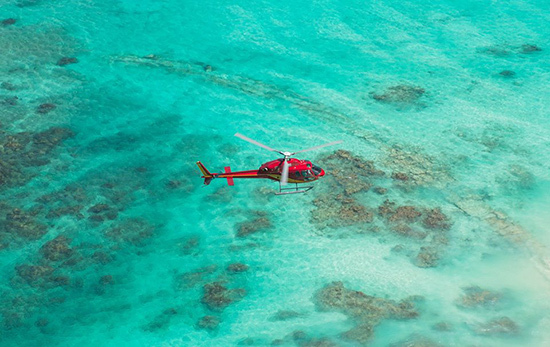 For safety and quality, Corail's helicopter services are the ones of choice region-wide. Corail offers a variety of tours of St. Martin (over Tintamarre, Pinel and other protected cays in the area). However, their best seller is their scenic helicopter tour of Anguilla. You can arrange to either start your tour in Anguilla or in Grand Case, St. Martin. (Depending on where you start, tour from North to South or South to North.) "Lift off" and you are swept up into the clear Caribbean skies (NOTE: if weather is not clear, Corail will re-schedule your flight, no cancelation fee). Get ready for a blast of blue! 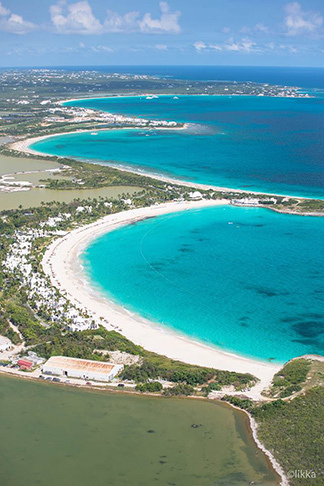 That's all you see as you fly over Anguilla's crystal clear seas and off-island cays. 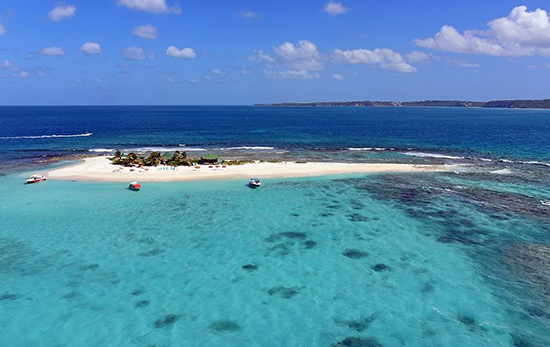 TIP: To see more of Anguilla from the air, start your tour in Anguilla. Stunning in every way, Anguilla's azure waters shine so clear and bright and St. Martin makes for a jaw-dropping background. 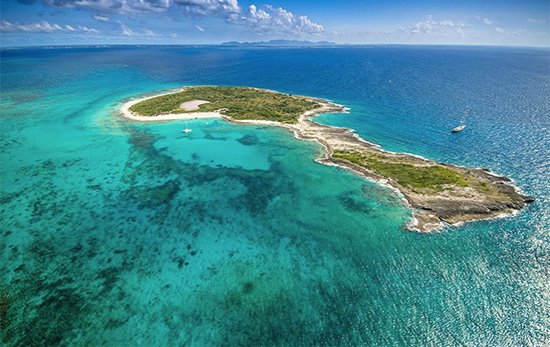 Past Sandy Island and Prickly Pear, you skim above the sea, all the way east to Shoal Bay East and the alluring, pristine beach of Scrub Island. 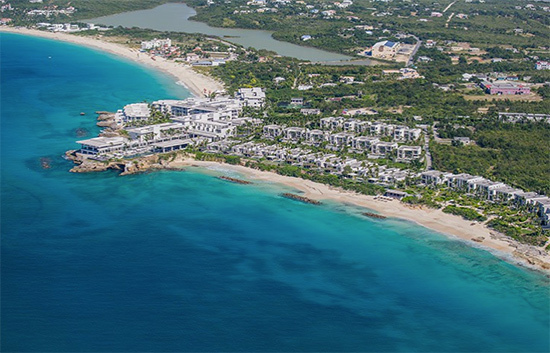 The real advantages to a helicopter tour of Anguilla? You take your time flying over each beach. You get an up close view of Anguilla's most spectacular beaches. And, Corail's pilot points out sights and landmarks along the way. 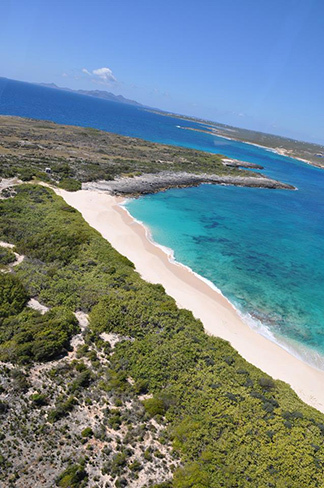 An intimate way to experience Anguilla from the sky, this is the closest you can get to Anguilla from above. Talk about a true BLUE thrill! The whole tour lasts about 25 minutes. Tours can be booked private (2 people min.) or as part of a group (5 people max. in any given tour). Rates are quoted per helicopter. Equally popular to their helicopter tours of Anguilla is Corail's transfer service. Step off your plane at Princess Juliana Airport (SXM) and Corail is waiting for you. The transfer includes airport meet and greet where Corail's staff helps you with your luggage and escorts you to your helicopter. 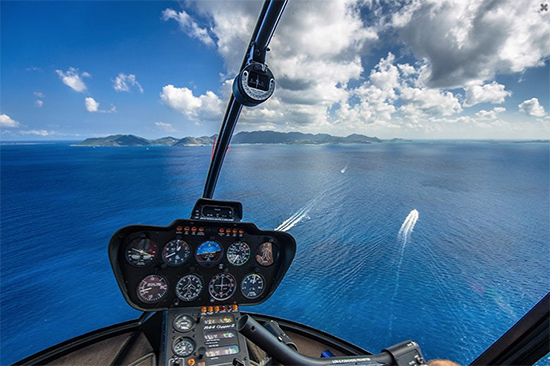 Corail's helicopter transfers have become a favorite way for St. Barths-bound travelers to travel back and forth. The reason? Efficiency and professionalism. Always on time, Corail "gets you there" fast.